Motor Torpedo Boat (MTB) was the name given to fast torpedo boats by the Royal Navy and the Royal Canadian Navy. The 'motor' in the formal designation, referring to the use of petrol engines, was to distinguish them from the majority of other naval craft that used steam turbines or reciprocating steam engines. The capitalised term is generally used for the Royal Navy (RN) boats and abbreviated to "MTB". 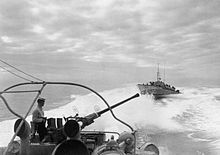 During the Second World War, the US Navy boats were usually called by their hull classification symbol of "PT" (Patrol, Torpedo), and are covered under PT boat although the class type were still "motor torpedo boats". German motor torpedo boats of the Second World War were called S-boote (Schnellboote, "fast boats") by the Kriegsmarine and "E-boats" by the Allies. Italian MTBs of this period were known as Motoscafo Armato Silurante ("MAS boats", torpedo armed motorboats). French MTBs were known as vedettes lance torpilles ("torpedo-launching fast boats"). Soviet MTBs were known as торпедные катеры (torpyedniye katyery; "torpedo cutters", often abbreviated as TKA). Romanian MTBs were known as vedete torpiloare ("torpedo fast boats"). After the end of the War in 1945, a number of the Royal Navy's MTBs were stripped and the empty hulls sold for use as houseboats. MTBs were designed for high speed, operating at night, low speed ambush (to keep noise low and to produce no wake) and manoeuvrability on the water; this was to enable them to get close enough to launch their torpedoes at enemy vessels. With no significant armour, the boats relied upon surprise and their agility at high speed to avoid being hit by gunfire from bigger ships. The British and Italian navies started developing such vessels in the early 20th century, shortly before the beginning of the First World War. Italian MAS boats were comparatively small, at 20-30 tons displacement. MAS 15 was the only motor torpedo boat in history to sink a battleship, the Austro-Hungarian vessel Szent István in 1918. British torpedo boats of the First World War were small at only around 15 tons and were known as Coastal Motor Boats. In the Second World War, British MTBs were operated by Coastal Forces. A similar size boat with a different role in the Second World War was the BPB 63 ft (19 m) High Speed Launch used by the RAF. 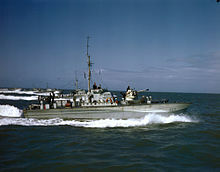 The last MTBs in the Royal Navy were the two Brave-class fast patrol boats of 1958 which were capable of 50 knots (93 km/h). Many boats designated MTBs. A variety of designs were adopted and built. For instance, a 55 ft (17 m) type, capable of 40 kn (46 mph; 74 km/h), was shown in 1930. The Vosper private boat was designed by Commander Peter Du Cane CBE, the managing director of Vosper Ltd, in 1936. She was completed and launched in 1937. She was bought by the Admiralty and taken into service with the Royal Navy as MTB 102. Crew: 2 officers, 10 men. MTB 102 was the fastest wartime British naval vessel in service. She was at Dunkirk for the evacuation and carried Winston Churchill and Dwight Eisenhower when they reviewed the fleet before the Invasion of Normandy. Although various boat lengths were produced by Vosper for the Royal Navy, the "70 ft" boat was produced from 1940. The design was produced with modifications as MTBs 31-40, 57-66, 73-98, 222-245, 347-362, 380-395 and 523-537. Using three Packard V1-12 marine engines, they were capable of around 37 kn (43 mph; 69 km/h). Early models carried two 21-inch (533 mm) torpedo tubes, two 0.50 in (13 mm) machine guns and two 0.303 in (7.7 mm) machine guns. They could also carry four depth charges. Between 1943 and 1945, two Vosper designs appeared, the "Vosper Type I 73ft" and the Type II. This design remained in use after the war. These boats were used by the Royal Canadian Navy 29th MTB Flotilla. Originally designed as Motor Gun Boats (MGBs) carrying a 6-pounder (57mm, 2.24 inch) to engage enemy small craft, they were re-designated Motor Torpedo Boats. Scott-Paine Type G 70 foot boat. After the end of World War II a number of Royal Navy vessels were stripped and sold for use as houseboats. These included Motor Gun Boats as well as MTBs. Many of these were moored in Langstone Harbour, Littlehampton, Hayling Island and Wootton Creek, although most have now disappeared from these locations. Nowadays[when?] most MTB houseboats can be found at Shoreham-by-Sea (West Sussex), Cobden Bridge (Southampton) and Bembridge (Isle of Wight). Fairmile D motor torpedo boat - British "dog boats"
^ "Midget Torpedo Boat Has Forty-Knot Speed" Popular Science, April 1930, p. 38. ^ Simons, Philip; Hall, Nick (2006). Retired on the River, a Short History of the Houseboats of Shoreham (3rd ed.). World Ship Society, Small Craft Group. p. 3. Wikimedia Commons has media related to MTB (boat).